Cameron Mitchell stars in Mario Bava's unusually well written and plot based Viking Film. E-M-S German R2 DVD. Knives of the Avenger is a rather hard to define film - dating from the end of the European adventure movie boom, that saw mythological heros, swashbuckling pirates and vicious Vikings brought to the screen in a series of colourful and epic adventures and made in a year that saw the Spaghetti Western boom really kick off, the film resembles a cross between the two genres, with the usual pitched battles of the adventure films replaced by a smaller scale and very personal conflict and with many traditional Western clichés - the lone horse riding hero, the fight scene in a tavern and vague boundaries between hero and villain. More unusually though, the emphasis here is not on action scenes, with the plot acting almost as filler (as was the case with many of the adventure films of the time), but on deep characterisation and plot development. It is this that gives the film genuine tension and suspense, with the audience able to really care for the characters and although there are fewer fight scenes than might be expected, they are made all the more tense by the genuine characterisation. Accordingly though, the pacing is quite slow, but the film certainly never drags and it builds to a nail-biting conclusion. From a historical perspective Knives of the Avenger is a very interesting film, being the first Viking film to focus on internal conflicts rather than the exploration and pillaging of Britain and Europe, and would seem to be the inspiration for the later 'authentic' Viking films Hrafninn Flýgur (1984) and Viking Sagas (1995). As far as historical accuracy goes, some details such as the Völva (the female Shaman seen at the beginning of the film) are authentic for the Viking era, while the use of a recurve bow (seen in the picture above) is subject to some debate but the whole atmosphere is considerably more accurate than Bava's earlier Gli Invasori (1961). Mario Bava was not initially attached to this project, for the second time in twelve months, he was brought on board to salvage a production that had been halted, this time by the producers simply running out of money - unlike the Ringo del Nebraska (1966) he did at least get the director's credit here. With a limited budget, he apparently rewrote and re-shot almost the entire film in a matter of days. Much like his Western, the end result certainly does not resemble a typical Bava film, with lots of location shoots and none of the exotically lit studio sets for which he is best known - but fortunately it does look very good throughout, with a sense of gritty realism suiting the storyline considerably more than the fairytale style atmosphere of Bava's earlier Pepla. The versatile Euro-cult composer Marcello Giombini (Sabata (1969)) provides the soundtrack and in keeping with the tone of the film, it is very Western style. American born Cameron Mitchell was king of the B-movies and had a long run in European cinema, working three times with Mario Bava and being one of the very few actors the director actually called a friend - he gives yet another strong performance here as the rugged hero and certainly convinces in the fight scenes. The very widely travelled character actor Giacomo Rossi-Stuart (Kill, Baby, Kill (1966)) gets a short but noticable role as King Harald, while the beautiful Elissa Pichelli who plays his wife, marks this as her only film credit, despite a good performance. 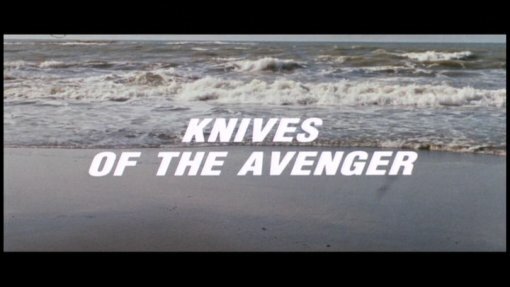 Knives of the Avenger is a rather unexpected film; essentially a Norse Western, it boasts some incredibly strong characterisation and storyline development, with solid direction and acting throughout. Certainly not for anyone just wanting an action movie, this should appeal to those who enjoy more carefully paced and plot based films. Fans of Mario Bava should certainly seek this out, showing that he could make very different movies to that which he was most famous for. For those interested in Viking history, this film is not as accurate as the Icelandic films of Hrafn Gunnlaugsson, but effectively resembles what a lot of day-to-day conflicts would have been like. Highly recommended. Anyone famous in it? Cameron Mitchell - an American actor who also starred in Bava's earlier Viking film Gli Invasori (1961). Directed by anyone	interesting? Mario Bava - one of the best known Italian cult directors, who made his name on horror titles from Black Sunday (1960)	to Baron Blood (1970) but also worked on Pepla and Westerns. Any gore or violence ? Some violence, and a couple of bloody death scenes. Who is it for? Fans of Mario Bava and the more plot based Euro-adventure films should enjoy this. The print is good with strong colours, and only slight grain and print damage. Audio English, German and Italian audio. The English track is generally good and is dubbed well. The Italian and German tracks both sound good. Note: The German track is missing in a few scenes, which are presented in English. Subtitles German #1 - subtitles for the English audio track. German #2 - infill subtitles for the missing scenes German audio track. Very detailed on-screen biographies of Cameron Mitchell and Mario Bava (in German only). Bonus trailers for Blood and Black Lace (1964), Ulysses (1954) and Gordon, il Pirata Nero (1961). Other regions? Available on R1 disc in the US, as part of Anchor Bay's Mario Bava Collection. Print quality is generally similar - the R1 disc lacks the photo gallery, but includes English subtitles for the Italian audio. Also on a low quality R0 release from Raro in Italy without English options or special features. Note: The opening credit sequence is presented before the Witch's dialogue, some prints have this the other way around (as on the German title sequence bonus feature). Impressively written, and with strong production and acting, this film is very interesting. Highly recommended. A great looking DVD, with a good English audio track. Fans prefering subtitled Italian audio, or wanting to see the rest of the Mario Bava films in the set should go for the US boxset, but for anyone wanting this film on its own, this disc is a good choice. Find our reviews of other films directed by Mario Bava. Find out more about the Norsemen in cinema at the Mondo Esoterica guide to Viking Films. All text in this review written by Timothy Young - 6th August 2007 - updated 13th April 2011.